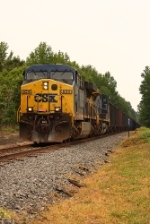 Description: 2 CSX trains meet at ensel yard, not sure on date. Description: CSX stacktrain Q190 chugs eastward upgrade at 'Conte Luna', otherwise known as milepost 16.3 of the NS Morrisville Line connecting track, behind a pair of AC60's on a bright afternoon. Description: Contrast of big and little at Bridgeport, AL with Sequatchie Valley SW1200 #1210 working the interchange track as CSX AC60CW #654 thunders past with intermodal train Q120. Description: CSXT 654 leads an eastbound mixed through Girard. Description: Duel Big 6's lead the L173 southbound for J-ville. Description: CSX 654 and CSX 680 lead a stack train west as Amtrak's late running Lake Shore Limited comes around the bend headed east. Description: Q264 eastbound at Amsterdam station. Description: Eastbound under the bridge. Description: CSX empty coal E747 heads north out of Deepwater with a string of hoppers from the Conectiv plant at the end of the line. 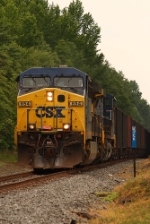 Description: CSX 654 heads north past the RICK marker with its consist of empty coal. 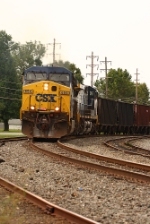 Description: CSX 654 heads north past the RICK marker with its consists of empty coal.